Your B2B email marketing should be much more than putting together the email and pressing send. Given that most B2B email marketing newsletter content continues on your site, there are some important things that you should remember to maximize the online visibility of your newsletter. In doing so, you help ensure your content marketing gets found by many more people than just those in your email marketing databases. Most email marketing newsletters carry abstracts or snippets of the stories. Readers then click through to a website to continue reading. If you’ve got good email marketing content you’re going to post on a public part of your site—content for which you’d like to get found via organic search—optimize your content for the search engines. Make sure your email copywriters understand SEO. All the best practices for website SEO apply here—keyword-rich content, title tags, alt tags, headings, meta descriptions, URLs, etc. Don’t let your web team choose some abstract URL. Ideally, copywriters of your email content understand SEO and the keyword strategy for the article/page, and can specify a keyword-rich URL consistent with that strategy. Every once and a while, we’ll get an email in which all of the articles link to a single web page containing all of the email’s content. Keep page content focused. If you have multiple articles in your email, put them on individual pages on your site. This will help with SEO. It’s surprising, however, how many companies don’t specify ALT tags in html emails. Unfortunately, that practice (or lack thereof) also occurs when those same images are posted on the web page where an email article continues. The lack of ALT tags for images on the website, however, isn’t an issue for the user (i.e., whether the image loads); it’s an issue of search engine optimization. ALT tags on your site should be a sentence or two that describes the image and contains keywords aligned with the keyword strategy of the respective web page. Incidentally, for a given image, you will likely not want the same ALT tag in both the email and on the page on your site where the story continues. The ALT tag in your email should be used to induce people to open or load your email; the ALT tag on your site is primarily for search engines. If you’ve got good email content that continues on your site and you want that content publicly accessible, make sure you link to that content from other areas on your site. If you don’t link to that content from elsewhere on your site, site visitors and search engines aren’t going to find it. Also, intra-site linking is important. It’s not too hard to remember to link out from the body copy of your content to other pages on your site. It’s a lot harder to remember to review body copy on other site pages and insert links with good anchor text that point visitors to new content on your site. If you offer an html version of your email on your site, make sure you remove any tagging related to subscribers. Also remove links to your profile center, forward-to-a-friend, and other similar links. If you post an html version of your email on your site, consider having an RSS feed for the section where you post these versions. Savvy people who may not be ready to or may not want to subscribe could still get notified. Sure, anonymous people, including competitors, could get a feed of your email-marketing newsletter. But assuming you’re not uptight about requiring an email address and more interested in getting your message out, then there’s no reason not to do this. If your email has several pieces of content that continue at different URLs on your site, subscribers click through to various pages on the website. Each is a destination. The problem is, once they’re on your site at a given article, subscribers can’t navigate to other content in the email without going back to the email. An onsite sub-navigation menu, on the other hand, provides links to the other articles. Think of it as a mini table of contents in a sidebar on every page. Subscribers can easily click to the next article of interest without returning to the original email. It’s not only a convenient and user-friendly format, it promotes and encourages more click-through to other content of interest. There are lots of ways to promote sign-up on your site. What you choose to do depends on what real estate is available within page layouts, the content on your site, the nature of your industry and prospects, and the overall roll and importance of email marketing. One option is to put sign-ups on every page. You never know which page someone will land on (especially via search engine referrals), and you may miss a sign up opportunity if they don’t they continue deeper into your site. Some may think this is overkill. You know your customers, prospects, and industry and what makes the most sense. Perhaps limit sign ups to the pages relevant to the pages most likely visited by those in various stages of the purchase cycle. Certainly, the home page and news pages, and also pages with educational and information content. 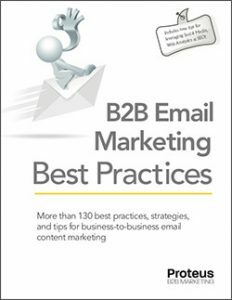 The above information represents 8 tips from our recently released eBook on B2B Email Marketing Best Practices, which contains more than 130 best practices, strategies and tips.